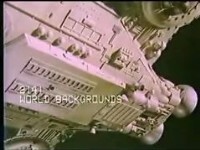 The World Backgrounds library sells footage to TV production companies. 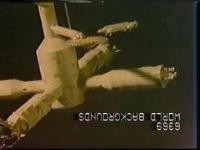 Space 1999 shots are mixed up from many different episodes, and other series (including UFO ), and even footage of world war 2 airplanes or 1970s trains. Catalogue descriptions are of varying quality (one UFO clip is labelled "cheesy cheesy flying saucer"). These were sold on to TV production companies, which used them in various TV shows and music videos. TV shows with stock footage included Dr Who , Wonder Woman , The Tomorrow People and The Two Ronnies . Films include God Told Me To , Spaced Out and The Sheriff and the Satellite Kid . Music videos included bands such as The Rockets, Kansas, Peter Schilling, Flock Of Seagulls, Rush, the Rah Band and Fuzzbox. Many of the shots have appeared in DVD quality on the Network Complete First Series (2010) and others in HD quality on the Complete Second Series (2015). Many shots in the catalogue were not available on the Blu-ray sets, so I have included them here, even though the quality of the samples is poor, sometimes terrible. Many shots are reversed left for right, or even played upside down or backwards (I have corrected some of them here). 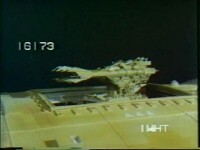 Note that Network Complete First Series contains one shot which isn't Space 1999 at all: a shot of Saturn is from the film Saturn V .
Even if the shot appeared in the episode, the library version is often longer, typically 10-20 seconds, while edited into the episode it would be 5-10 seconds. A number of alternative takes are in the library, some close to the final version, some very different.